We put recycled 2016 model Titleist Pro V1x golf balls from LostGolfBalls.com head to head with those fresh from Acushnet and can confirm what others have previously reported. There was no measurable difference in distance nor trajectory for every club in the bag from driver through wedges. There’s really two reasons. Golfers play used golf balls because after one hole every ball is “used” to some degree and some golfers even play them exclusively. You know, those “previously loved” ones lost by others often in a watery grave. Secondly, the question of how much the performance is compromised by spending time in a water hazard appears to be answered. If the ball is relatively a recent water resident most of us will find it still plays just fine. Having said that, if you’re getting ready to tee it up in your first professional major or maybe just the club championship no one would dispute spending the money for new ones. Krueger also told us that though the number of lost balls in the U.S. is immense, “No one is sure [and] 200 to 300 million seems to be an estimated range. 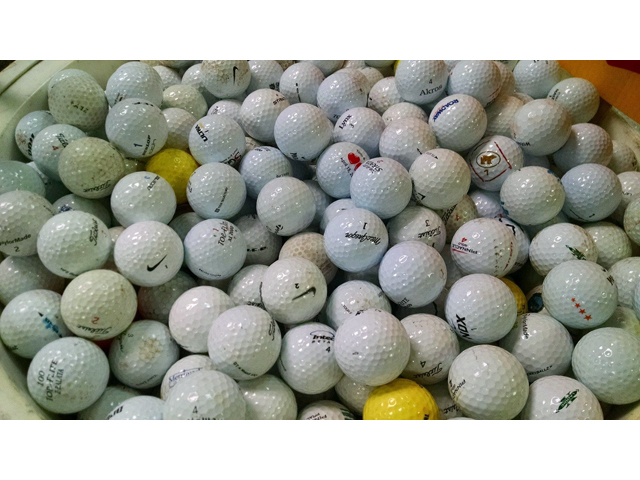 His company recycles—which means washes, inspects and grades–some 43 million golf balls per year and there is also a thriving business in refurbished golf balls, those that have had the cover treated to remove stains and/or repainted. Bottom line, Krueger sells first quality—meaning virtually no blemishes, no scuffs–2016 model Titleist Pro V1s and Pro V1xs for $26.99 discounted to $21.59 plus shipping which depending on where you live probably takes the cost per dozen to around $30. Order two dozen and the cost per drops to about $26. The local golf shop is selling new ones for $47.99 per dozen. It’s your decision.